Recycle, reuse: Translation Memory, or TM, is the translation equivalent of sustainable development. It “recycles” text by saving it in memory and then reusing it the next time a translation of the same content is needed. Today’s intelligent content creation means the same content may be re-purposed for a variety of sources such as websites, blogs, product documentation, communications materials and so on. Lexcelera uses the most advanced TM tools in the industry to ensure that the same text never needs to be translated twice. Even similar texts can be adapted with less effort than to translate from scratch. Because it also supports translators who are collaborating online on the same project, consistent terminology is assured, even while a translation is in progress. Lexcelera also integrates Translation Memory seamlessly into an optimized machine translation process, which involves checking the TM for an existing translation before generating a new one. 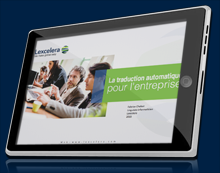 Lexcelera’s TM process guarantees significant savings – not to mention gains in speed, efficiency and consistency. What’s even better is that costs continue to decrease over time as the memories are enriched with new translations.